All T-shirts are 100-percent cotton (Fruit of the Loom or Alstyle brand) with prints on both front and back. This image is printed on the back of all t-shirts. 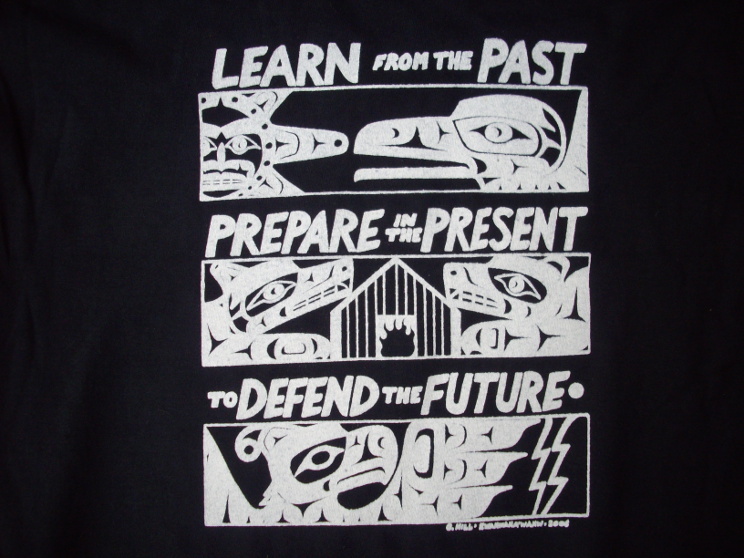 On the back is the graphic “Learn from the Past, Prepare in the Present, to Defend the Future” (by Gord Hill, Kwakwaka’wakw). Graphic by Gord Hill, Kwakwaka’wakw. Design by Gord Hill, Kwakwaka’wakw. A Thunderbird with masked warrior in centre. Design by Gord Hill, Kwakwaka’wakw. 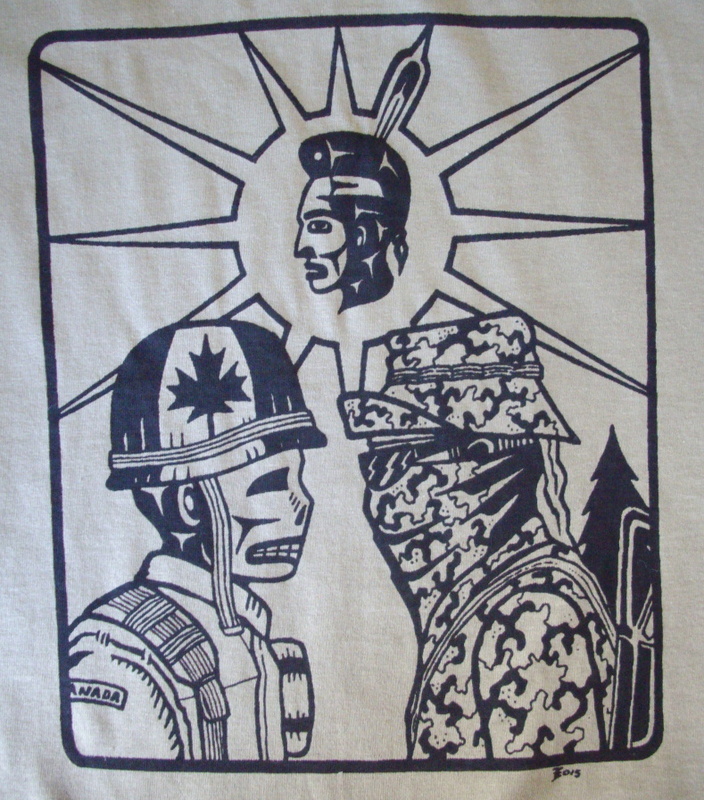 Iconic image of masked and armed warrior confronting Canadian soldier during the 1990 Oka Crisis. 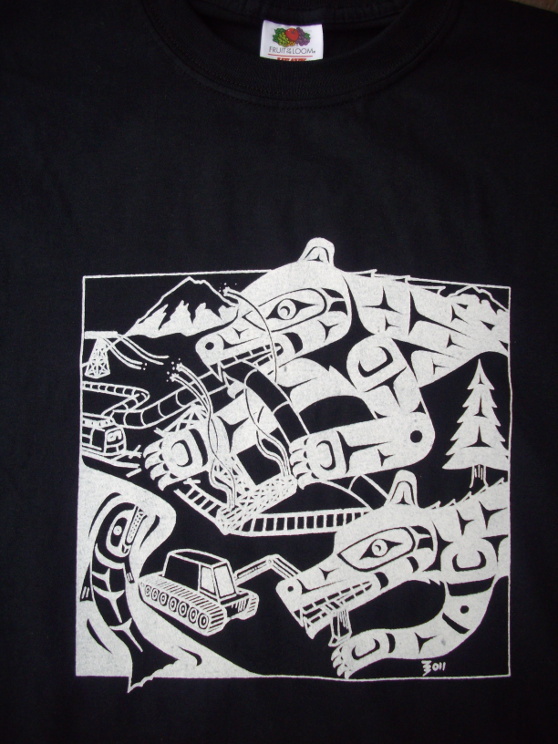 Design by Gord Hill, Kwakwaka’wakw. 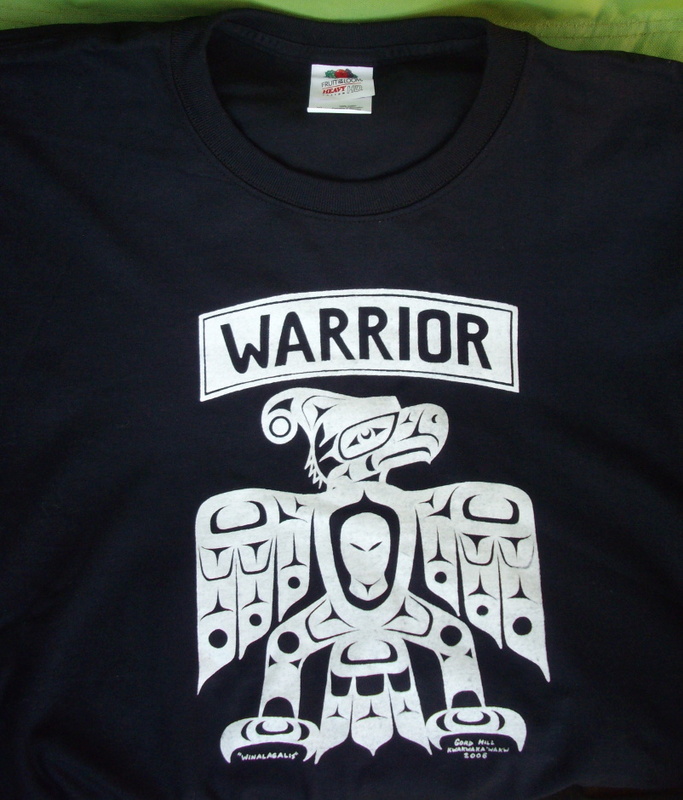 Depicts a Tlingit war helmet with two weapons that were common along the Northwest Coast: a dagger and whalebone war club (same as the Keep Calm and Warrior On T-Shirt but without the text). Design by Gord Hill, Kwakwaka’wakw. Is there a way to order more than one shirt at once? Wanting to support and make a larger order for eastern crew. It could be arranged, how many shirts were you thinking? I know people are busy up there, and this is a repeat request. I’d like to order four t-shirts, but seems the only way is to place four separate orders. Can invoice me through PayPal for four shirts and shipping to the U.S.? Thanks. How could people send Warrior donations? Do you have a paypal account? There is a Paypal account for buying t-shirts, which purchases and/or donations can be sent through. 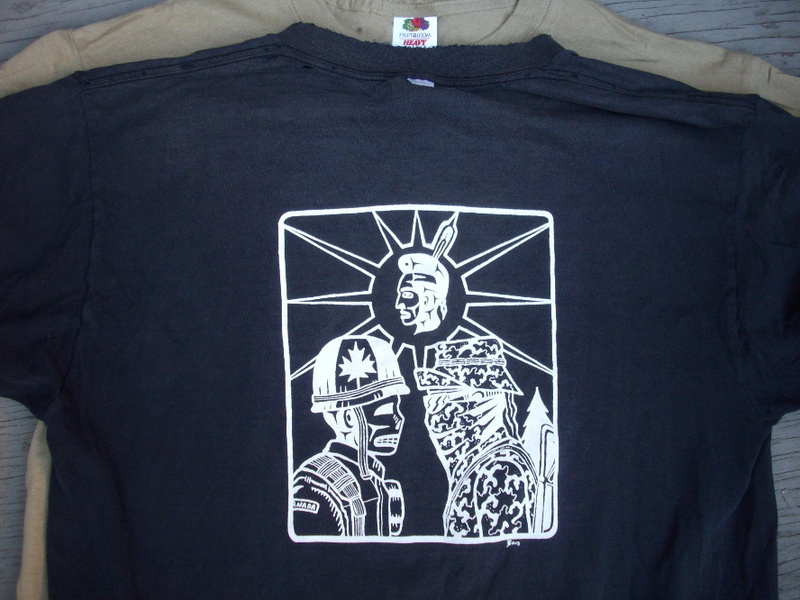 is it possible to get more t shirts in kahnawake or something ? We shall continue to fight together as one. Hi, are t-shirts still available? Also, is there a way of getting in contact with you by email? Got my T-shirt today thanks and keep up the fight!! Hello! We (Rogues In Paradise) are supporting Native causes, we’re with you. I’ll be looking for you in Facebook. Regards from London. Hello there, just wanted to check whether international postage is O.K. before placing an order. Would be extremely grateful to receive one of these T-shirts here in Australia. In admiration and respect from Sydney. The price includes postage whether domestic or international. I will order all four. Will you take a cheque or do I need a MO? I am in the bush and have fifty miles ro go to a bank but the PO works around here. We can get 2XL sizes. Im looking for T-Shirts and Baseball Caps with MiKmaq Sayings or Anything MiKmaq, Gesgapegiag or Listiguj. HELP IM 70 YRS OLD AND CANT WAIT TOO LONG.Waalalin. Sorry I can’t help you with that, perhaps some Mi’kmaq out there are producing shirts and caps? STOP THE DUMP from coming to Ingersoll…please see our Facebook page. We need more help. 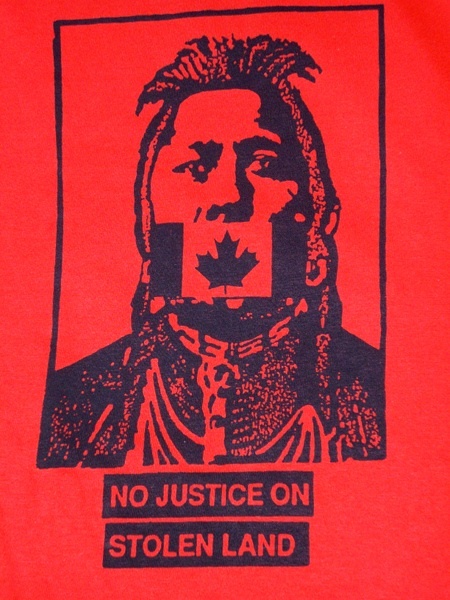 We would like to purchase Idle No More flag to show our support and solidarity with the movement. Are we able to purchase a flag ? Or can you direct us to a site to do so ? I am unaware of any INM flags. Wondering if you still have any Warrior patches? Would love to have one or a few shipped down to the States if at all possible. Thanks! how do I pay for a shirt. Not interested in paying over the computer. hi. are any of the t-shirt designs available as prints? If so, I am interested. please pm details. Thanks!! Are the prints silk screened or how are they put on the tshirts?? Yes they are silk screened. In terms of sizes, what are the dimensions? Not all smalls are the same small so I just wanna make sure I know what I’m buying before I buy it! Are t-shirts still available? Also would it be possible to know about how long to get a tshirt? Would be shipping to Vancouver island. Thinking of Xmas gifting a couple. Yes the shirts are still available. It usually takes 7-8 days to process orders and ship the shirts out. Mail to Vancouver Island would be 2-3 days at most. Any big boy sizes? Xxl? Who do I email for an order? Anyone help locate the tshirts for murdered missing women /sisters ? Could you please post a size chart? I personally can wear two different sizes, depending on the dimensions. Nobody wants to order blindly, while not knowing if it will fit properly. Thank you. I know the original comment was old, but yes, I agree. Every brand of shirts is different. The shirt maker should be able to provide you with an official size chart. Also, are they all men’s sizes? Hello here is a real other Mapuche from Germany. I was born in La Union 1982. My Real Name is Arnoldo Ramiro Lara Gutzman. I was in La Union bit i can not find my Mother. 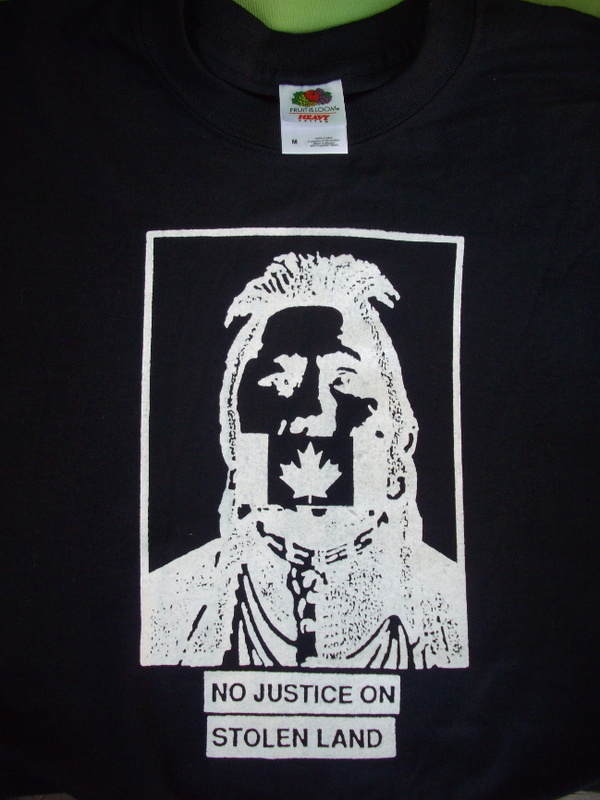 People keep asking me who is on my shirt (no justice on stolen land)….? that I would be very proud to wear ! I was unable to order this with credit card this morning. the shirt is come in last Week on Wendesday, that was fast, thank you ! and How much is it together to pay? Sorry, i forget the Colour, t-shirt and the Hoodie in Black, is this possible? LOL hola. you guys gots some small Natives over your way… wheres the 2xl, 3xl,4xl, and 5xl? hey I just ordered the oka design was,lol hoping I could get the pipeline design sent instead, on black as I specified in the other order. thanks again! Hi I wanna purchase many shirts..
Do you deliver in Switzerland? Ever considered designing a residential school memorial/honoring orange shirt for Sept. 30th? I am very appreciative to have learned of this history. Hey zig. Wondering if your other has salves for sale online. if not, just wondering how i might get some. Thanks. I love these shirts and am interested in purchasing, just wanted to check and see if any of the dagger and warclub shirts (w/o the keep calm text) were still available? Thank you! Would like to order a Keep Calm t-shirt for a relative in Military Green, by credit card from u.s.a. But somehow the site won’t let me do this. Do i have to go though a Canadian retailer? Hi. I am from Mexico, can you shipp here? send a lot of solidarity to the indigenous resistence in the north and i hope we can make some bridges, becose the struggles of your people and ours are the same. 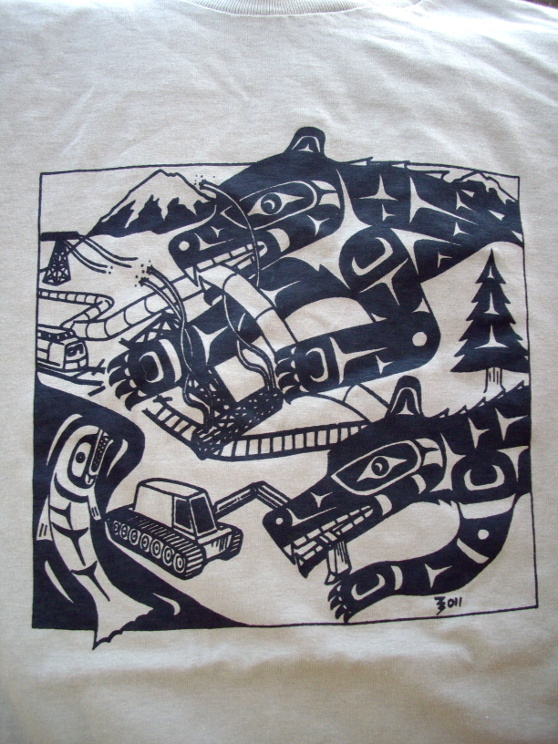 Extractivism and neo colonialism against community and indigenous peoples. Thank you! I received my shirt today. I might have ordered the wrong one though. I wanted the bear wolf shirt but got the Thunderbird one instead. It’s not a big deal I love it anyways! I did reorder the bear wolf shirt today though. Hello Zig ! Thank you so much for all your good work keeping us updated with the newsletters. I wanted to support the Website/Spread the love by buying 2 shirts, Are Military Green Still available ? Hey, Paypal won’t let me buy t shirts. Help!